For current events, visit our calendar! Peer ministry – is an education of the heart. Peer ministry – it is a way of life. It is a habitual practice of doing unto the least of these, to the glory of God and service to the people met in every circumstance. Peer ministry – is kids ministering to kids. Peer ministry – it is the story of the Good Samaritan. Only instead of preaching and teaching it, you get the skills necessary to live it. What does this mean, you ask? Another great question! What it means is that you have the opportunity to learn skills that will help you in all of the relationships in your life – not just now, but for the rest of your life. It means that you’ll be able to recognize others who may be in need of a friend, or a neighbor – in the way that the Good Samaritan treated his neighbor. It means that you’ll learn ways to deal with troubles in your own life, and how to seek out another’s help should you need it. And at the end of a year, you will be commissioned as a member of Covenant’s 2017 class of Peer Ministers. Total training time is 20-30 hours. Use the skills you learn (and document it. 20-30 hours of skills practice is required). Complete a Peer Ministry journal, which you’ll receive when you agree to participate. All this will be done with the help of your trainers. At the end of May, you will be commissioned at a worship service. The ceremony is known as “The Order of the Towel,” as you are commissioned as ministers and servants. What’s the cost? The Peer Ministry journal is $10. If you can’t afford it, we’ll provide it for you at no cost. That’s it! The biggest investment is in your time, but the returns on that investment will be incredible! If you are interested in being part of this ministry, or would simply like to hear more about it, e-mail Mark Doll at markdoll@chorus.net, or call 873-7494. Please consider this carefully – this is life-changing stuff! The Youth Team Needs Youth! Although the youth team does have one eighth grade student as a member, the rest of us are parents, some with younger children, some with older children. But what we really need is some more youth to help give us ideas of what YOU would like to be doing! If you are a 7th-12th grader interested in shaping the direction of your youth program and activities, please join us at our Youth team meeting on the 2nd Wednesday of the month at 6:00 PM. 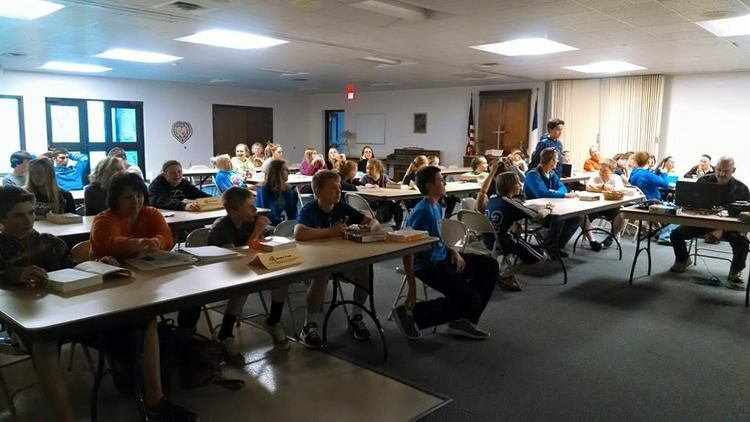 A WEDNESDAY EVENING AT CONFIRMATION CLASS. 9th graders, please sign up for your Confirmation interview on the bulletin board to the right of the bubbler. Remember that you will not be able to sign up for your Confirmation interview until you have met your requirements for sermon notes and service credits. Confirmation students, remember that there is a service component for confirmation. Please pay attention to various opportunities that will enable you to fulfill this requirement. Opportunities such as joining a choir, participating in mission projects, teaching Sunday school, Adopt-A-Highway (see above!) and many others will fulfill the requirement, help an area of ministry, serve others and will be fun! As new opportunities exist, we will try to keep our confirmation students apprised, but many of them will show up in The Promise as well, some on the Youth page. Please look for these opportunities! Make sure you are paying attention to both your sermon note and service credit requirements. For 9th grade students, remember that you will not be able to sign up for your confirmation interview with Pastor Mark until these requirements have been met. For confirmation parents who haven’t been part of our confirmation program in past years and are a little unfamiliar with what happens during Lent: Students are required to attend Lenten Wednesday evening services (beginning with Ash Wednesday) and complete a sermon note. The Ash Wednesday service is a full hour, but subsequent services are about 40-45 minutes in length. Families are encouraged to attend these services together; we believe you will get a lot out of them. There are no confirmation classes during Lent. Again, attendance is required, but we know that there may be reasons for missing, such as family vacations, Trees for Tomorrow and illness. A service component has been added to our Confirmation requirements this year. Please pay attention to various opportunities that will enable you to fulfill this requirement. Opportunities such as joining a choir, participating in mission projects, teaching Sunday school, and many others will fulfill the requirement, help an area of ministry, serve others and will be fun! As new opportunities exist, we will try to keep our confirmation students apprised, but many of them will show up in The Promise as well, some on the Youth page. Please look for these opportunities! Youth ministry at Covenant is vibrant and life-changing with mission trips and camp experiences, peer ministry training, education and service opportunities. Youth at Covenant grow in faith while reaching out to others in the congregation and community. © 2015-2019 Covenant Lutheran Church. All Rights Reserved.